UPDATED: Thu., Feb. 16, 2017, 9:33 a.m. When: Continues through February; open 5-10 p.m. Friday and Saturday. Closing reception planned from 6-9 p.m. Feb. 25. Border walls and immigration bans were merely campaign slogans when Spokane artist Michael Dinning first started constructing his sculptural wall painting “Fence” last year. The finished piece now hangs at Marmot Art Gallery in Kendall Yards – images of immigrants and refugees taken from a 100-year-old photograph on Ellis Island, “fenced” in behind strands of wire. From all four corners of the gallery, despite some heavy themes, Dinning’s large paintings and sculptures pop with vibrant palettes, musical nostalgia, and unexpected layers. The themes range from explorations of relevant social justice issues such as homelessness and addiction to whimsical ruminations on the power of the arts to bring relief and pure joy. 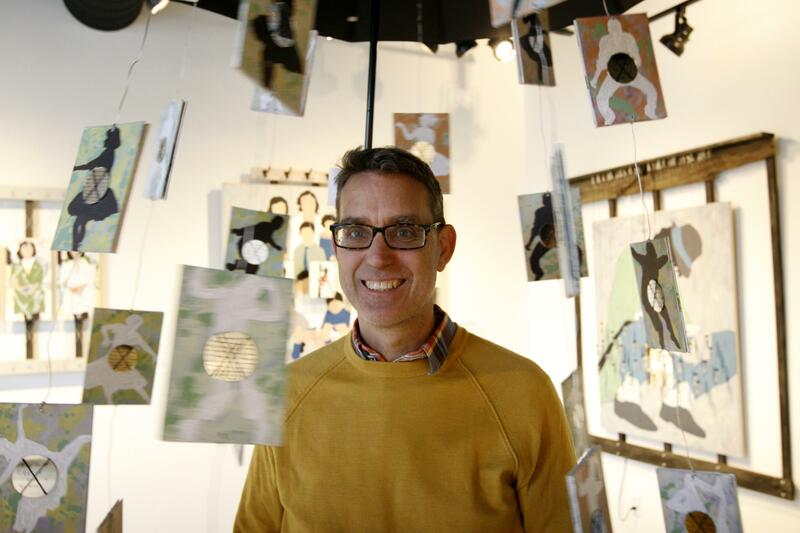 “After the election, it seems like people were upset and depressed, so I wanted to do a piece about lives of pure joy, about finding joy when bad stuff is going on around you outside,” Dinning said. The result is Dinning’s sculpture “Grey Skies,” from a line from the 1960 song “Put on a Happy Face.” His piece incorporates small images of faceless dancers from that era, hanging and swinging like a multi-paneled mobile under an open umbrella, where a brightly lit bulb also hangs. Layered on top of each dancer’s image is a shiny mirror, and on top of those are hand-written excerpts from Dinning’s favorite authors, such as Gabriel García Márquez. Music, dancing, literature – all are happening under the light, protected from any downpours of negativity by the open umbrella. The exuberance Dinning communicates through his work is a direct reflection of how Dinning feels about his life now. After losing their favorite babysitter a couple of years ago, Dinning and his wife decided that Dinning should quit his managerial job at a digital business services company and become a stay-at-home dad. Within a few months of being home with the kids, Dinning picked up a paintbrush and started painting again, after a 10-year hiatus. So shortly after moving to Spokane from Seattle 12 years ago, Dinning hung up his sculpting tools and put down his paintbrush. Like many an artist before him, the new realities of a mortgage to pay and babies to raise took precedence. A decade later, Dinning has found his creative voice again. “Now I’m super happy with my life, and I think my work reflects that,” he said. New Orleans-style music and 1950s dancers are inspirations for several of Dinning’s works. In “Shoo Fly,” he plays with the Mardi Gras song by the Flaming Arrows. He uses the repeated imagery of flies with trumpets and frog lids stitched on top, meant to echo the great repeated call and response of the song – always the same, but always a little different. Behind a wall of suspended flies is a painted photograph of a 1950s-era couple dancing. Dinning credits a surprise trip to New Orleans he gave his wife for her birthday in 2015 with getting him back into painting. “The history of the city and the music and all that set off a whole bunch off ideas percolating in my head,” Dinning said. In “Remedy,” a down-and-out man, either homeless or suffering from addiction, is layered with a picture of a woman dancing, representing the joy he could access if he could fix his problems. Suspended in front of the painting are pill bottles with worry-dolls inside, representing possible fixes or panaceas. “Like in the ‘Remedy’ piece I cut a square out of the canvas so I could have the image of a woman behind, actually showing up through the canvas,” Dinning said. Due to the inclement weather for First Friday this month, Marmot will hold a closing party for the artist on from 6-9 p.m. Feb. 25, that is free and open to the public. Published: Feb. 16, 2017, midnight Updated: Feb. 16, 2017, 9:33 a.m.